The Spanish flu epidemic of 1918, which spread around the world over an 18-month period, is considered the deadliest epidemic in history. It infected an estimated 500 million people worldwide (about one-third of the planet’s population) and killed an estimated 50 million victims, including some 675,000 Americans. Retired physician Alice Frazier and educator Steve Shaw will explore the unfolding of the “Spanish flu” and its connection to World War I at 7 p.m. on Wednesday, Oct. 10, at The Barn at Stratford, 2690 Stratford Road, Delaware. This program is sponsored by Willow Brook Christian Communities and Fidelity Federal Savings and Loan Association. It is free and open to the public, however, there will be an opportunity to make a donation to help defray the operating expenses of the Delaware County Historical Society. To ensure adequate seating, registration is strongly suggested. Register online at Eventbrite.com or call DCHS at 740-369-3831, ext. 3. Frazier earned her B.A. in zoology from the University of Connecticut and her M.D. from The University of Toledo. She is a graduate of the Ohio State University Family Medicine Residency program and practiced in Sunbury for 22 years. She then worked in two clinics for the medically underserved, in Marysville and Mansfield, before returning to the Family Medicine Department at The Ohio State University College of Medicine as an assistant professor. In 2002, she received the Distinguished Educator Award from the OSU College of Medicine, having taught medical students throughout her career. She retired from OSU in 2012. Shaw is a graduate of the University of Rio Grande majoring in history and education. A master’s in adult education from Ohio State University led him to a career in job training programs. Since his retirement from the Ohio Department of Education, he has been an active volunteer with DCHS, contributing in many areas. Shaw conducted extensive research into World War I for a 2017 DCHS presentation which gave him insights about the flu pandemic of 1918 and 1919 and how intertwined the War efforts were with the worldwide scope of the outbreak. For more information, email Programs@DelawareOhioHistory.org or call 740-369-3831, extension 3. 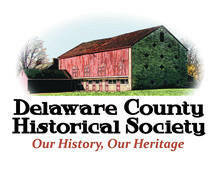 The Delaware County Historical Society is a nonprofit organization whose mission is to promote, preserve and sustain interest in the history of Delaware County. The Barn at Stratford is operated by DCHS as an event venue for weddings, corporate meetings and other special occasions. To learn more, visit the venue and society web sites at barnatstratford.org and delawareohiohistory.org.